Stenocactus - or Echinofossulocactus! - and because of the wide variability of the plants, there have been many specific names put forth, many of which are no longer accepted by the scientific community. I'll be posting a few of the ones we have, identified as best we can in the next few days. I was hoping we could get through the winter without any snow but that wasn't to be. We got about 3 or 4 inches (7.5 - 10 cm.) of snow this evening. It'll probably be gone by tomorrow morning. This is another of my favorite haworthias: Haworthia arachnoidea var. scabrispina. It's quite rare in collections since it's one of those which doesn't produce offsets readily and is a slow grower. This one was grown from seed and is about 5.5 cm diameter. Lophocereus schottii monstrose - "Totem Pole"
After my last post, the new anti-virus program I installed slowed both of our computers to a snail's pace, making it almost impossible to get anything done with the internet. But now it's working the way it's supposed to, so... Even though there's no flowers, these weird cacti (originally from Baja California) are always quite striking. We really enjoy having them around. Years ago a friend of ours had a really big one which was threatening to break the glass in the top of his greenhouse, so he gave it to his neighbor. His neighbor wasn't really that much of a succulent fancier, so he left it outside too late in the fall. Result: One large pile of mush. Oh well, not here. We like these things too much! Of course it's Lophocereus schottii monstrose form (Synonym: Pachycereus schottii monstrose), the famous "Totem Pole" cactus. 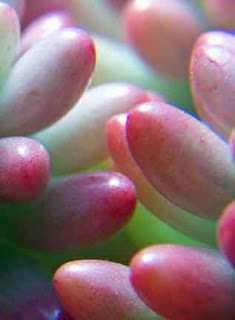 When nothing much else is flowering, count on the echeverias to do their part. Been doing computer upgrades today and installing the new anti-virus software. So when I had a moment I shot these flowers in one of the greenhouses. Haven't had much time for anything else. Hope you all had a good holiday and are looking forward to a wonderful new year! Whether you are Christian, Jew, Muslim, Hindu, Buddhist ... or none of the above ... I wish you peace and love in this season. And especially for those of you who visit this blog periodically, best wishes for a season of blessings and a wonderful new year. OK. 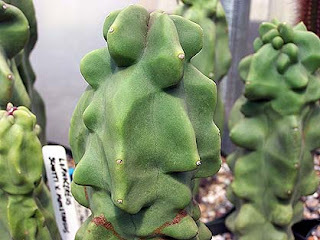 I just couldn't resist posting this photo from the Cactus Lover blog. 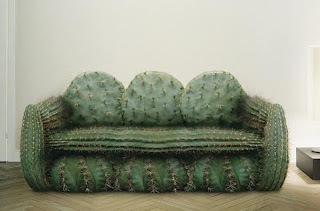 I'm not sure where this was or who did it, but I do know I wouldn't want to sit in it. Zowy! Thanks to "Soccer" in Thailand. My apologies. It appeared that I posted photos of two different haws yesterday. Both are magnifica var. splendens, but the second photo is from location GM447. The first doesn't have location data but is clearly from one of the localities where the plants develop the glaze. GM447 also does. Not all do. This is another image of GM447. It was a bit sloppy of me as the differences are readily visible. This is a specimen of Haworthia magnifica var. splendens, about 8.5 cm across. 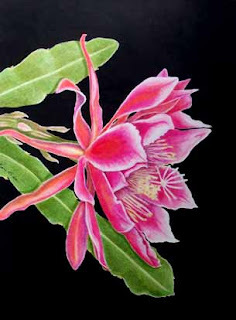 It's developed the nice "porcelain" glaze, like a piece of fine pottery, that is characteristic of some of these plants. Since about 90% of the leaf surface is covered with this glaze, it's a very slow growing plant. It was grown from seed. Finally, the weather has changed and we're back to normal - even more normal next week. While I was out in the greenhouses I noticed the Aloe albifloras are blooming. I'll try to get a photo tomorrow. And we should have some other winter bloomers in the next few weeks. Some of you have met Ladybug. Some of you know her by reputation. Some only by the picture at the top of the blog. Our other horse, Jardinera, hasn't quite gotten the picture that in Oregon - unlike Florida where she came from - you need to grow a winter coat. Ladybug, on the other hand, must have the Winter coat genes in spades. By the time our recent cold arrived, it would appear that she had almost doubled in size. But it's all hair. This is her two days ago from the window in our den. I wish I could take the cold as well as she does! One of the nice things about these little jewels is that they flower later than just about anything else. Here it is almost Christmas and "wow", it's putting on its show. No archive photo this. Took it this morning, along with the Aloe below. It may be cold outside, but some things are still blooming in the greenhouses. One of these items is Aloe krapohliana var. dumoulinii. This is supposed to be one of the more difficult aloes to raise, but we've had a few of them for several years now and they're doing fine. Easy does it on the water; that's the main rule. This variety tends to clump more readily than the type and like the type, the flowers are large for the size of the plant and are quite spectacular. Our cold snap should go away over the weekend - back into the 40s by Sunday. And now the great plains, southern states and the eastern seaboard will be getting the cold along with a good dose of snow. And I don't want to over do it about the cold. We get it pretty easy here. I'm aware that others may have it much worse than we do here and empathize with those who are really hurting due to the weather, rather than just complaining about it. Many will have their lives turned upside down, not only in this country, but in Sao Paulo (flooding) and elsewhere. We encourage you to donate to an organization which provides assistance in such situations. These aren't flowering right now. It's just a bit cold out there - for another night. But they are out there shivering in the cold night. These particular Echinocereus viridiflorus plants come from Colorado, up near the border with Wyoming, and they're quite hardy. They'd better be. Our temperatures right now are almost rivaling those of Wyoming and Nebraska. ... Notice I said "almost"! But it's going to be into the teens again tonight! Enough already! We're expecting another night of this and the greenhouse heater still isn't working right. So, another night of temporary heaters. And I'll have to get up in the middle of the night to check 'em! Argh! This is Sulcorebutia canigueralii, another archive photo. It's too cold for anything to want to flower here right now. And on top of that, one of our greenhouse heaters went out so I've been out in the greenhouse setting up some temporary heat for tonight until I can fix the other heater tomorrow. Aren't greenhouses fun? And of course, it's going to be the coldest night of the year: 15F (about -8.5C). Begone O Ye wintry arctic cold! Neohenricia sibbettii is a true miniature. This is an extreme closeup showing the rugose leaf tips. They can make a very impressive mound if grown nicely and they're quite easy to grow, but to me they are most impressive under the closeup lens. I just got back in from the greenhouses to make sure the heaters are working OK. We're getting our first (and hopefully last) dose of arctic weather with lows in the mid 20s (-4C) tonight and into the teens (-8C or so) tomorrow night. Uhg. We've had some winters without a true hard frost, but obviously this isn't going to be one of them. At least there's no moisture with it and it won't last more than 2 or 3 days as it moves east where it's supposed to be - on the plains! Mammillaria shurliana, Mammillaria goodridgii, Mammillaria goodrichii var. rectispina, Mammillaria rectispina, Bartschella blossfeldiana, Neomammillaria blossfeldiana, Ebnerella blossfeldiana, Chilita blossfeldiana, Mammillaria blossfeldiana var. shurliana, and Mammillaria goodridgii var. blossfeldiana. I just read all those out loud and my tongue is all tied in knots, so I may as well hit the sack and get some sleep! Today (December 4) was Lynn-Marie's birthday, so excuse me if I don't spend time blogging...This is birthday month for our family with a whole bunch of them coming in a row. But this one is special and the whole day belongs to her. So enough here. More tomorrow. If the flowers aren't there, there's always the magnifying glass or the closeup lens for a bit of the "other worldly" that we mostly overlook. What a shame. OK. I can get back to adding some photos this week. We have a large drop box here which I was filling with a variety of stuff to get rid of - including a whole bunch of rambling blackberry vines (trees!). (No one should ever go without luscious berries here in Western Oregon during the summer. The native vines aren't too bad, but the others, brought in by European settlers, are very aggressive!) I'll never ever complain about cactus spines again! Never! To be honest, I didn't have time to do any photography this week, but this little rascal was flowering (Rebutia muscula). Maybe the nice weather we're having has got it's inner clock whacked out of shape, but there it was, with several flowers on December 1. Hey, I'll take it whenever I can get it!